So remember way back when I cut into some pieces of my Flea Market Fancy? It was to make this!! It's the Scrap Happy Purse from Amanda Jean over at Crazy Mom Quilts. The second she posted a picture of her version on Instagram asking for pattern testers, I was in. It's such a cute bag, why wouldn't I want to make my own! 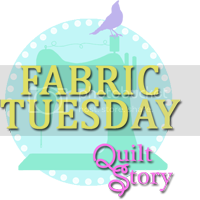 The pattern was really easy to follow, it's mostly a basic tote, with a great outer layer. I was able to use a bunch of scraps I'd gotten in a scrap pack from the Anna Maria Horner store clean out a couple months back. I'd been saving them for just the right project, and this was perfect. Then, I added a couple charms I'd gotten; two were the FMF, but there was also an AMH velour, a couple Tula Pink prints, and some dots. All that quilting is really awesome too. Because it's quilted so densely onto batting, it pretty much has all the stability I'd want. And then, when you add the home dec weight lining, you have a bag that will really take a beating. I've been toting it around for a while, and it's been great. I love the size of this tote. I can carry around a book or a small knitting project, or I can just tuck in a diaper and wipes if I'm doing a quick trip with the toddler. I'll probably make another of these because I have plenty of scraps, but I might have to add a couple more pockets because I can never have too many pockets. Thanks Amanda Jean for letting me test for you! 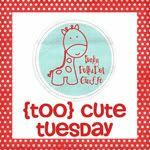 Linking up with Quilt Story for Fabric Tuesday and Funky Polka Dot Giraffe for Too Cute Tuesday and My Quilt Infatuation for Needle and Thread Thursday!